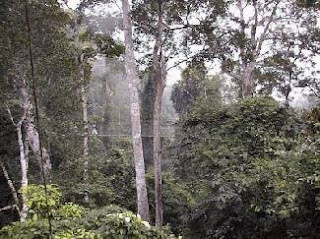 Ghana's forest cover of about 8 million hectares at the time of the country's independence had dwindled to less than 2 million hectares. Madam Esther Obeng Dapaah, Minister of Lands, Forestry and Mines, disclosed this, adding that over-logging by illegal chain-saw operators and timber contractors had compounded the problem. She said excessive surface mining, conversion of natural forest into agriculture land, annual bushfires, expansion of infrastructure and changes in land uses also contributed to the dwindling. Madam Dapaah was addressing members of the Ghana Timber Association (GTA) at their Annual General Meeting under the theme: "Helping To Build Ghana Through The Conservation of Our Forest," at Akyawkrom in the Ejisu-Juaben District of the Ashanti Region on Friday. She said the current state of the nation's forest resources should be a major concern to all Ghanaians since it was very critical to the survival of the forest reserve adding that the Ministry had stepped up efforts to reclaim the lost forest belt. Madam Dapaah charged the Forestry Commission to comply strictly with the provisions of the existing statutory legal regimes in granting timber harvesting rights, to stem the tide of unhealthy practices. She said this would ensure that foreigners who had sited timber processing facilities in various tree plantations and forest reserves in the country without the requisite approval from the authorities were barred from operating. She said the effective implementation of existing legal provisions in respect of forest resources would assist in reducing illegal logging, waste control in logging and processing, as well as a significant reduction in over-exploitation of timber. Mr Osei Kwame Boateng-Poku, president of the GTA, said the Association had established over 280 hectares of tree plantations, including teak, cedrella and edinam, at the Boumfuom Forest Reserve in the Asante-Akim North District as part of programmes lined up to boost the reserve. He also said the Association would also establish 700 hectares of tree plantation within the reserve to ensure ecological balance of the area.